Desperate to escape living with her miserly uncle, Marjorie Easton eagerly accepts a job offer from the strange Michael Crispin despite knowing nothing of the employment except that it is well-paid and includes some kind of research. Much to her surprise, the “research” involves séances and requires Marjorie to develop her own psychic gifts to assist in communing with the dead. Soon she begins to suffer from terrible nightmares and seems on the verge of a nervous breakdown, but the real terror begins when Crispin dies under mysterious circumstances during one of the séances. Who is responsible? And what is the significance of the “six queer things” the police discover among his belongings after his death? 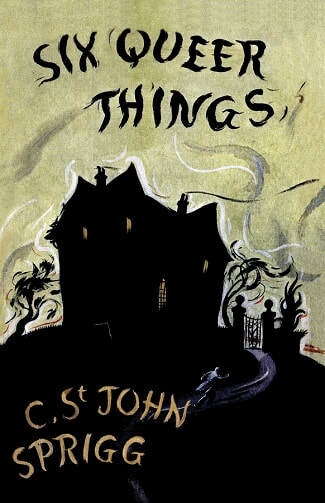 A Golden Age mystery with echoes of the occult, The Six Queer Things (1937) was Christopher St. John Sprigg’s seventh and final novel, published posthumously after his death in the Spanish Civil War. This first-ever reprint of his scarcest novel features a reproduction of the original jacket art. Christopher St. John Sprigg was born into a Roman Catholic family in Putney, southwest London, in 1907. He published seven mystery novels as “C. St. John Sprigg,” beginning with Pass the Body (1933), published in America as Crime in Kensington. However, it is for his nonfiction writings focusing on Marxist ideology, published posthumously under the pseudonym Christopher Caudwell, that he is best known today. He died in 1937, killed in action while serving in the International Brigade during the Spanish Civil War.